You can hereby display the URLs processed in the WebAssistant in different detail views. URL Log Display loaded URLs in the main menu. Traffic Statistic Display a traffic statistic in the main menu. Browser Server Protokoll Display HTTP protocol between WebAssistant, browser and server in an additional window. You need this information only to a purpose of an analysis of the loaded URL. Logging slows the surfing down. You can collect URLs in a report. From the report every address can be retrieved. You can collect the URLs regarding the following criteria. This report can be created newly automatically daily, weekly or monthly. This URL History can be downloaded also automatically. After all URLs are downloaded, the name of the list is the todays' date. You can rename this name in the file system. A link to URL History pages are available also by navigation (command ls). 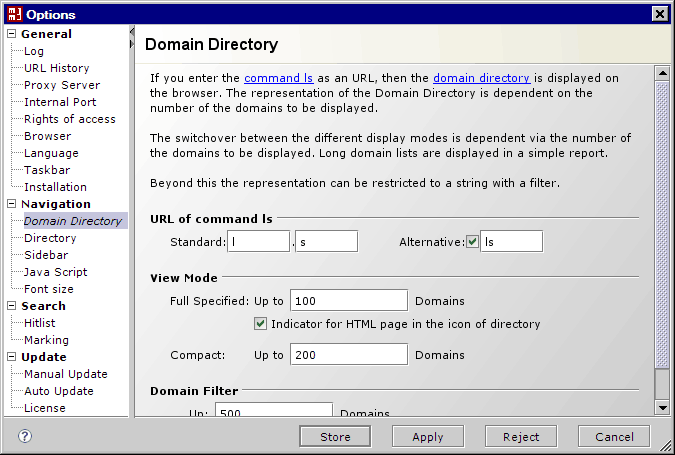 You can delete every URL History with the delete function on the respective HTML page. An internal port is used for the HTTPS processing. The port 8888 is used in the WebAssistant per default. If this port is already busy by another application, choose another port number, please. This port doesn't have to be entered in the browser! Only the local computer has access. Computers within the specified IP area have access. You reach the fastest access with the setting Public. At this setting, you should however block unwanted access from the outside with e.g. a firewall. The number of listed HTML files in a Page is configurable. These can be sorted and displayed differently. In the view Extend HTML files are listed with their title and description as well as approx. 200 characters text. A session identification can be marked or removed. An indicator is additional activating. The indicator displays, whether HTML files are available in a sub-directory. Result of a search is displayed as a hitlist. The files (pages) are listed with their URL, size, date of archiving as well as 200 characters. The number of hits on a page to be represented is adjustable. You can display every page of a hit. The link Marker marks in addition the search words in the page. The marking is configurable with a Cascading Style Sheet (CSS). Checks, if there is a new version available weekly or monthly. The check cannot be deactivated in the evaluation period.